The Bamboo Bike Studio offers a two day bike building course in Brooklyn, where they claim you can "Walk in Saturday, Ride Out Sunday." One weekend is all it takes to fabricate a frame from bamboo, assemble the components, and roll away with a custom-fitted ride, tuned to each student’s body and cycling style. The cost of the class directly supports the Bamboo Bike Studio’s efforts and partnership with the Columbia Earth Institute-based Bamboo Bike Project and Millennium Cities Initiative to seed the first bamboo bike factory in Ghana, where reliable and cheap bicycle transportation can dramatically improve access to jobs, commerce, education, basic food and water resources, and health care. To kickoff the workshop and website launch, the Bamboo Bike Studio is partnering with Brooklyn-based design center 3rd Ward for the Green Bikes Birthday Block Party, Sunday May third. The festivities will converge on Stagg Street in Bushwick, Brooklyn, NY for bike competitions, bands and music videos, badminton, drinks, BBQ, live screen-printing and more. The Bamboo Bike Studio team will be riding 10 deep to event, where they will host a live bike building demonstration, have bikes on hand for viewing, and offer a sign-up sheet for classes. For fun, for learning, for building a better ride and a better world; the Bamboo Bike Studio offers customized rides made from a local-harvested, fast-growing natural resource, and a bottom line that supports responsible light industry growth and progressive, self-propelled transportation in developing countries. The Bamboo Bike Studio goes live on Sunday, May 3 at the 3rd Ward Block Party in Brooklyn, New York. Ian Mahaffy and Maarten De Greeve's "Hoop" was selected as the new standard bike rack to be installed by the city of New York. This cast metal circular design is evocative of "an abstracted bicycle tire" according to the City transportation department judges who selected the winning entry.Eco Jym likes it because it reminds him of "Ron Cobb's ecology symbol." Read more. Ride along with former Talking Heads frontman David Byrne as he bikes across Brooklyn to show off his whimsical bike rack designs. Update 7/7/2009: Christopher Long sues NYPD. You've seen the video of New York Police officer Patrick Pogan tackling bike rider Chris Long during the Critical Mass bicycle ride through Times Square last week. If you haven't seen the video, it clearly shows Pogan targeting a cyclist then tackling him to the ground with a violent body check. The video shows Long riding and steering away from Pogan when Pogan runs directly at the cyclist and knocks him hard to the ground. The Smoking Gun posted Pogan's sworn statement in which he says he arrested Long because Long "steered the ... bicycle in the direction of [Pogan] and drove the bicycle directly into [Pogan]'s body, causing [Pogan] to fall to the ground and causing [Pogan] to suffer lacerations on [his] forearms." The Manhattan attorney's office filed charges of "attempted assault in the 3rd Degree" against Chris Long as a result of Pogan's statement. Chris Long spent 26 hours in jail after his arrest. All I can say of Pogan is "Liar Liar Pants on Fire." Pogan played high school football and was chosen as an offensive lineman for the 2003 Long Island all stars team. Gothamist: Pogan's father, a retired NYPD detective, says "You do what you gotta do to make the arrest." Unbelievable. Meet Matthew Modine (Private Joker in "Full Metal Jacket") as he rides his bike on Tuesday, July 15 through Brooklyn and the Lower East Side. He'll stop at a number of local bike shops to spread awareness about his September 20th event - Bicycle for a Day. • a fun, open and proactive invitation designed to inspire individuals, communities, governments and corporations to take a step towards solving the current environmental issues. • a global initiative bringing together people who choose to ride a bicycle rather than use gas-powered motor vehicles, immediately reducing their carbon footprint. • supports organizations that restore and protect our environment and make biking safer and more accessible for everyone. DUMBO, 35 Pearl Street, Brooklyn, NY 11201. Bay Ridge Bicycle World, 8916 3rd Ave, Brooklyn, NY, 11209. B's Bikes, 262 Driggs Ave, Brooklyn, NY, 11222. Nelson's Bicycle Shop, 251 Bushwick Ave, Brooklyn, NY, 11206. Continuum Cycles, 199 Ave B, New York, NY, 10009. Matt Modine's ride concludes with an Art Show to support BFAD at Phebe's Tavern, 361 Bowery, New York, NY 10003. Transportation Alternatives in New York City held its 7th annual Commuter Challenge yesterday. Streetfilms had cameras on each of the car driver, cyclist and public transit user and Elizabeth Press stayed up all night to create the video of the challenge in less than 24 hours! Do you remember the DKNY orange bikes of fashion week? A short film by Kalim Armstrong documents the backlash to DKNY's ad campaign. "Orange Bikes Take Manhattan" screens this Friday at the Bicycle Film Festival in NYC. Here's the trailer. 32 2nd Ave. at 2nd St.
Orange bikes documents the reaction to a guerrilla marketing campaign during fashion week. Orange monochromatic bicycles appeared chained as part of DKNY's "Explore your city" campaign. The bikes were reminiscent of the Ghost Bike memorial project, white painted bikes that serve as markers where cyclists have died in traffic accidents. This film explores the backlash to the marketing campaign. ...now read the commentary. These people are way too uptight. The video is obviously a spoof -- who believes DKNY actually made this video? Who believes that brunette is actually a real supermodel? And why all the hate toward DKNY? Do you really want them to end up in a marketing textbook as an example that you shouldn't use bikes in your marketing because of backlash from fanatic true believers? DKNY are not preaching to the choir -- they're speaking to their audience, the people who are interested in fashion and style. They should be applauded for their efforts in reaching out to a new audience in their attempt to portray bicycling as a cool, fashionable way to get around. Three years ago, only the 40 year old virgin rode his bike to work. This year, we'll see Brad Pitt on a bike. More at Streetsblog. Props to Carlton. For Fashion Week in New York City, DKNY says to "Explore Your City" on bike. DKNY informs fashionistas of the benefits of cycling by noting New York's high population and flat terrain make it an ideal city for cycling; informing people that May is Bike Month in New York; DKNY stores in NYC are distributing free bike maps. 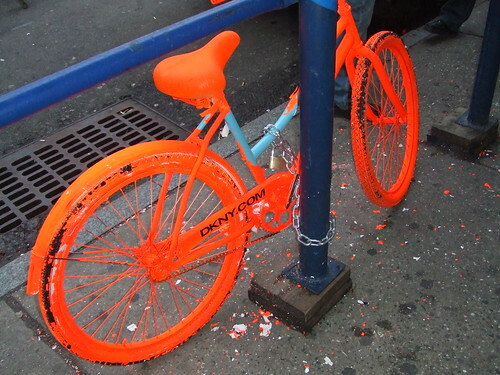 According to Conde Naste Portfolio, DKNY has also chained about 75 orange bikes around New York City, noting that it's a publicity stunt that's seems to have gone awfully well for DKNY. Why else would DKNY be mentioned by Bike Snob, Streetsblog, Bike Blog, Bike Hugger, Gwadzilla and now even Cyclelicious? Not all the attention has been positive, with some people thinking it's too much like the ghost bike memorials. Photo: "DKNY Pro Bike Campaign" from Amanda Ford in Brooklyn. I guess I should point out that none of the female bike commuters I encounter ever look like the fashion models pictured here. They mostly look something like me -- you know: a little bit dorky, wrinkly clothes, wripped and oily pant hems, smelly bike gloves, yellow jacket, helmet hair, a little sweaty -- they just usually have longer hair than me. I sometimes run into sanguine cuties like Emily though, too. Bike boxes are a reserved space just for cyclists at intersections. They are marked ahead of the car stop line and behind the crosswalk to improve cyclist visibility. Bike boxes allow cyclists to filter forward and get in front of motorists so they can position themselves correctly for a turn. They're used at intersections with heavy traffic volume (cars and bikes) and frequent turning conflicts. In New York, these bike boxes are on a one way street. Bike lanes are also marked on both sides of the one way. Read more at Streetsblog. These kids in Queens roll with 5000 watt amplifiers booming about 150 decibels of music on the streets of New York City. They make custom cabinets to house the systems, with more cabinets holding the car batteries to power the system. Most of the bikes have decorative lighting and some have DVD screens for viewing while riding, according to the Times article. Read more at the New York Times. Thank you to the Longmonster. Janette Sadik-Khan, the commissioner of the Department of Transportation, rides her bicycle to work. That the head of an agency long associated with car travel is an avid bicyclist symbolizes what might be a new way of thinking about how New York’s asphalt should be used. Ms. Sadik-Khan said her time on two wheels has become an important part of her work. Read more in the New York Times: To Ease a City’s Traffic, Shifting From 4 Wheels to 2. Tom asks: "I have a question about safe roads. I am planning a trip from Yonkers, NY to Canton, CT. There are many bike trails along the way, but I will have to use the roads in other areas. What is the best way to contact people who know the roads I am thinking of and if I am using the safest means possible?" I've visited the areas along New York and Connecticute but I'm not all that familiar with the region. Besides these resources, does anyone have other suggestions for Tom? BikeForums.net is a very active online community of cyclists of all levels. I'd try the Northeast regional forum for information about cycling routes. Bike New York has a handful of helpful resources such as "Ask a savvy cyclist". Bike New York's link to state bike maps is outdated, but you can find them at the State "Bicycling in New York State" website, which includes regional maps and state bicycle routes. Connecticut Bike Routes seems to have good information about cycling throughout The Constitution State. That's the vision of the New York Bike Share Project, an experiment in free bikes that ended yesterday. Twenty bicycles were available for free 30-minute rentals between Storefront for Art and Architecture and a roving, remote location. While the benefits of such a program are self-evident, the feasibility (and likelihood) is less clear. New York abounds with bikers, but the cultural attitude towards them is not necessarily positive. Some of this is, of course, derived from riders who stubbornly refuse to follow traffic laws (sometimes out of defiance, sometimes just stupidity), but a large part of it must be attributed to the city's apparent desire to actively combat cyclists instead of working with them (as the new parade regulations and recent Critical Mass rides have illustrated). Rebuilding Place: Bike sharing test in New York City. Rabbi Aaron Winternitz bought an old school bus, planted it behind his home in Spring Valley, NY, and converted the back half to a wood-fired oven to bake matzo. At the front of the bus is a stationary bike he uses to grind wheat to make the matzo flour. Bamboo bicycle building class OK. Now I really do need to go to NYC! What a great way to spend a weekend! New York City bike rack contest: Hoop wins How are they going to pin that thing to the ground? Seems like it wouldn't fit more than a couple bolts. Sure, stealing the rack with a bike wouldn't be convenient, but the rack itself doesn't see, like it would be all that secure, which seems like trouble to me. Ironic that it looks like a car steering wheel. That aside, let me be the first to say, "Nice Rack". @Tony: There's a photo of this rack in the wild at the NYTimes, but I don't have any clue how it's attached to the ground. Maybe it's glued in place? Boo.yah. Kate, I like those Austin designs - very nice. But does Austin plan to install 5,000 of those like NYC does? Considering that Austin has less than a tenth of NYC's population, and even less of which live in areas accessible by bicycles...no. That NYTimes pic looks photoshoped...concept image or something. Look at the way the chain lays on the rack, looks funny. Sweet. Love the design. Simple, clean, and it made me think of bicycle wheels and the ecology symbol as well. Those gear tree racks seem like a horrible idea. Just the ideaof tripping and running a shoulder into a giant line of gears...ow. Those new NYC racks should be popular with the "fixie crowd"...the thing looks like the requisite "Arrospok" (minus one spoke). It seems to be fixed to the ground by a mounting system that bolts to the ring and then to the ground. I think it looks pretty neat and would be beautiful if there were a dozen of them lined along the whole length of a street. I just wish these racks were designed with more than 2 bikes in mind. They fill up so fast! =v= Yep, I like the ecology symbol, and NYC has a handful of other designs by David Byrne. NYC also has two award-winning bike racks designed to protect street trees: [PDF format, 237kb]. While beautiful, it look extremely weak to me. An enormous amount of leverage can be put upon the tiny footprint at the bottom. It looks, however, like the NYT photo of it installed in Astor Place may involve a much larger footplate to solve this very problem. A typical design cop-out: Design an elegant object that cannot survive without an ugly prosthetic, but display it in magazines without that prosthetic. It's like electronic devices being shown without bulky ugly power cords. David Byrne's bike racks Very cool. Would be nice to see some municipality do a public art project that incorporates artist-designed racks. As with SF's "Hearts of San Francisco" or Chicago's "Cows on Parade," but with utility built into the art. but the racks look awesome! Criminal complaint against Christopher Long Thanks for the NYT link. Officer Pogan's behavior is unbelievable, disgraceful, disgusting, etc. Where should we send our notices of shame? Does Mayor Bloomberg know what's going on? I hope officer Pogan goes on to a rewarding, illustrious career as a mall security guard - unarmed, of course. Critical Mass rides are stupid--reflected by a good chunk of their participants. Even so, the behavior by the police officer is unacceptable. What makes it even worse is the lies that resulted in jail time. This policeman should lose his job. I'm not buying that story about the bike swerving into Officer Pogan, but I'm real suspicious about that supposed "sworn statement" because there's no signature on it swearing to anything! Without the officer's signature, it's just a piece of papers with words typed on it. Watch the vid. The cop walked up to him and assaulted him. Private Joker to bike through Brooklyn The annual car vs bike vs transit challenge This reminds me of a short I saw at the Bicycle Film Fest a few years ago called Yogurt vs. Gasoline. I had missed that Neistat production -- pretty good! In California the motorcyclist would have filtered through to the front of the line at every red light. ...lovely jamie kicked as w/out even trying...props... bikes rule... in the beginning she was holding a gray helmet, in the end there is a blue helmet on the bars, and during the middle she rode with no helmet? Can we see specs on the bike? Close up would be nice too. How about stats from her computer? Tire pressure? Heck, what kind of tires? Personally, here in the west I like Panaracers but I imagine on the East Avocets are still popular. Orange bikes take Manhattan I can certainly sympathize with the film maker and some of the thoughts on display in the trailer, but some of these "fashionistas" are just plain goofy. ...but going out of my way to sit in a theater ?? ?...maybe not so much... Interesting, never heard of this before. I have so much DKNY stuff (sweaters,reading glasses, shirts) that I'm called the DKNY boy by my girlfriend. But I dont know whether fashion industries should mess around , a few examples from the past show that they can never do it right. i meant mess around with bicycles in ad campaigns sorry. My honest opinion: I think some people have a chip on their shoulder and get way too serious about a fun activity. From the trailer, though, the film looks like it's probably well done. ...ya know, fritz...if they'd painted those bikes green & logo-ed them "we're going green" as an environmental statement, everybody woulda said "brilliant !!!"... My bet is that real cyclists hated the idea that bikes were being used to create retail sales volume and acted. Cyclists have enough crap to deal with and don't need to have the image of their rides being debauched by some knuckle-headed account executive. Jack If supermodels can't save the world, I don't know who can They are interested in fashion and style -- and have the attention span of an over-caffeinated 8 year old. Who cares, because once they find out that they'll sweat on their precious, expiration-dated clothes, they'll leave as quickly as they came in. They'll scamper off to the next thing, scooters or electric skateboards or dogsleds. I agree - the gothamist is being utterly snobby and hyper-sensitive. Poor, poor offended souls. Here was a chance to have a laugh with the fashionistas... and off of their native turf. We could have tainted their future trends. Nope, let's alienate when we have the chance... Oh gosh, now I've seen the clip. It's FUNNY. DKNY orange bicycles I noticed that second picture while I was looking through my wife's Elle magazine over the weekend. I didn't even notice who the ad was for though. I guess I was just too focused on the picture to read the copy. these ladies would look totally anonymous on the bike lanes of copenhagen... zakkalicious is right. I have lived in Amsterdam and one often sees tall, blonde Dutch girls (like the Danish girls in Copenhagen) dressed in business or going-out clothes on their cycles - and men in suits. But one also sees older - and rather heavier - people of both sexes, and where I was staying, many immigrant Dutch wearing Muslim or African garb on their bicycles. It is a stunt, and I'm twice the age (and half the height, broader in the beam...) of those models, but it is perfectly possible to do a short commute to work in normal clothing. Usually people ride to work in the early morning, so if you get sweaty, it is usually on the way back home to a shower. (you can simply change your top and "freshen up") upon arrival if you are in a warm climate where the heat comes earlier. NYC: Huge bike boxes The bike boxes seem to indicate that they realize the safest place to be, when stopped at an intersection, is in front of the cars. This way you don't get rear ended - the cars behind you do. But isn't filtering through traffic still illegal in NY? On this street it doesn't matter since there are bike lanes, but it still seems inconsistent. Queens bicycle ghetto blasters Off da HOOK! 5,000 watts beats anything I got: a cheapo guitar amp, power inverter, and 12v lawnmower battery. I once tried a low-power FM transmitter to leverage the motorists' superior in-car stereo system. Paul Freedman has a fully pedal-powered version of that (although less hi-tech, no DVDs and stuff), the Soul Cycle. The Rock the Bike folks are regulars at many Bay Area bike events. You see 'em around :-) New York City Traffic Commissioner bikes to work Best of luck to her and the Big Apple will be even better from her efforts! Definitely a breath of fresh air!